We’d love your help. 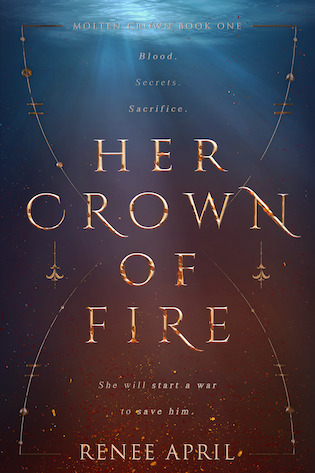 Let us know what’s wrong with this preview of Her Crown of Fire by Renee April. Under her dreams’ guidance, Rose lands in the fantasy realm of Lotheria–with a tagalong. Tyson, her best friend since childho In the dull, everyday world, seventeen-year-old Rose Evermore struggles to plan beyond her final year of high school. But when fire suddenly obeys her every command and her dreams predict the future, she becomes hungry for more of this strange power. Under her dreams’ guidance, Rose lands in the fantasy realm of Lotheria–with a tagalong. Tyson, her best friend since childhood, winds up there with her, just as confused and a hell of a lot more vulnerable. In Lotheria, Rose is welcomed and celebrated as a fire mage at the Academy, while the very un-magical Tyson is forced into hiding under threat of death from the headmasters of Rose’s new school. To ask other readers questions about Her Crown of Fire, please sign up. The MC has fire magic, normally I would want any magic power I’ve read about but If I had fire magic i might accidentally set my books on fire and I can’t risk that. She can be found on various writing sites such as Wattpad and Goodreads, but usually lurks on Twitter to hand out bad advice and Renee April is the author of the young adult fantasy novel, Her Crown of Fire.